Having finished fourth on her return in the Prix Ganay over an extended 10 furlongs last month, last year’s Rhododendron claimed the third Group One success of her career when becoming the first filly since Red Evie in 2007 to lift the mile showpiece. For a moment it looked as though Lightning Spear was going to go one better than in 2017 and break his duck at the top table, but it was not to be, with the 100-30 favourite holding on by a short head to give O’Brien his second victory in the race after the mighty Hawk Wing in 2003. 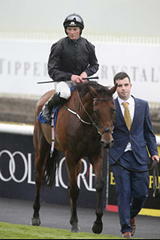 O’Brien said: “I was delighted, because she had run well either way. She probably got there little bit early and she was left there a bit lonely and left there a bit by herself, but Ryan (Moore) gave her a brilliant ride. She is brave and stuck her head out and toughed it out. I was delighted really. “It was a worry coming back to a mile. We thought the last day in France she travelled well through the race, John’s (Gosden) horse (Cracksman) won and won well, but we were always going a step slower than we would have liked through the race. “If you looked you would have thought she would be happy going a gear or two higher and that often suggests they have plenty of pace. “One day in France she bled the worst you’ve ever seen in the Oaks (Prix de Diane). I’ve never seen anything bleed so bad. It was the most unbelievable thing of all – she exploded in the race and sprayed blood all over the jockeys. “She got very faint in herself and it is very rare you see a horse come back from that. Winning jockey Moore, who was celebrating his first Lockinge victory, had nothing but praise for O’Brien’s his role in getting the winner back to her best. He said: “She’s been a great filly at two, three and now four. It’s testament to everyone who puts in the hard work at home. She’s been unfortunate not to have won more in her time. “She’s very adaptable with ground, distance and has got a great attitude. As for the David Simcock-trained Lightning Spear, a potential rematch at Royal Ascot could be on the cards should connections of the winner opt to go for the Queen Anne. Simcock said: “I’ve not had the wind taken out of me for a long time and that has taken the wind out of me slightly. I’m very proud of the horse. The Group One mile contest is the early season highlight for older horses and has been won by stars Frankel, Canford Cliffs, Farhh and Ribchester in recent years.